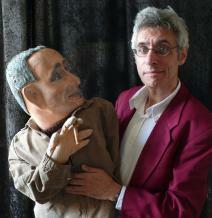 For more than 30 years, Ian Saville has been presenting his Marxist Magic and ventriloquism. Whereas David Copperfield is content with little tricks like making the Statue of Liberty disappear, Ian Saville aims at the much more ambitious goal of making International Capitalism and exploitation disappear. True, he hasn't quite succeeded, but he keeps on trying. The act can last for anything from 15 minutes to an hour and is suitable for all sorts of events and venues. If you are organising a social, a celebration, a training event or a public meeting, get in touch to see if Ian can add his magic. With singer Leon Rosselson, Ian presented Look at it This Way. 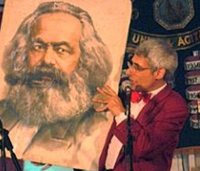 And he does shows for children (though Karl Marx and Bertolt Brecht don't feature in those). 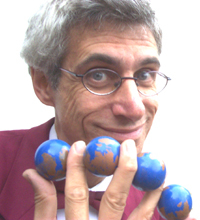 Awards won by Ian Saville include The Brighton Fringe Review Award, The Tapwater Award (a more acceptable alternative to the Perrier) and a Time Out Theatre Award. See what the critics have said in the reviews. Ian Saville has performed socialist magic on picket lines, at benefits, and at many labour movement events, conferences and meetings, to audiences all over the UK, and overseas. He's also performed in comedy clubs, theatres (including the National Theatre), arts centres, Performance Art events, universities and the Albert Hall. If you would like him to perform for your organisation, festival, theatre or campaign, or if you have ideas about how to develop the art of socialist magic, get in touch. 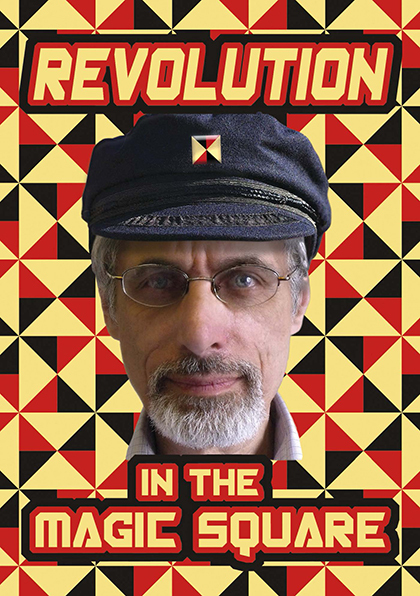 Ian Saville's new show, Revolution in the Magic Square has had a successful run at the Edinburgh Fringe in August, at the Middlesex University venue, Theatre Arts Exchange. You can see a clip from the London preview here. A new show with magic. Veteran socialist magician Ian Saville unexpectedly finds himself leader of the Magic Square. Will he be up to the challenge? Can socialist magic inspire a mass audience, or will it always be just a protest movement? Will Saville have to compromise his principles to get moderate magicians on board? Will the plots to get rid of him succeed? Who knows how it will all end? 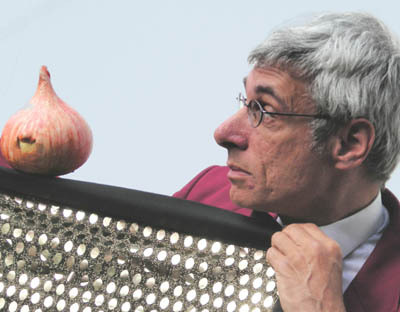 The first review from the Edinburgh run ("must see show") is at www.fringereview.co.uk. There is also an audio interview about the show with Paul Levy here. You can read Ian Keable's write-up of the first preview here. The Morning Star review (again, of the preview) is here. Links to more reviews on the reviews page. See a clip from the show in Edinburgh below. 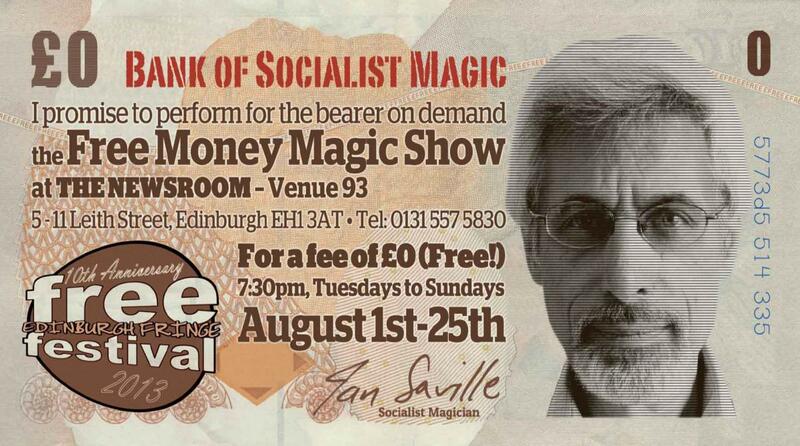 The Free Money Magic Show is the title of the last show from Ian Saville, socialist magician, which was premiered at the 2013 Edinburgh Festival Fringe. In the show, Ian investigates the real meaning of money. Where does it come from? Do we really need it? Ian consults experts, and his financial adviser, who turns out to be a dummy. Of course, Karl Marx plays a part, but also some new characters, and some new tricks. Find out more here.